Nowadays, you are probably used to the prevalence of drug testing - it is used by parents, by coaches, by schools, by law enforcement, by employers...the list goes on. Of course it was not always this way. For example, did you know that Olympic drug testing first debuted in 1968? Interestingly enough, the first athlete to be disqualified based on a drug test, Hans-Gunnar Liljenwall, was disqualified for alcohol consumption before the race. He earned this dubious honor at the 1968 Summer Olympics in Mexico City. I suppose the fellow could've used an alcohol test, no? Since the 1968 Olympics, drug testing has certainly grown in the athletic world. The NCAA, for example, has since 1986 tested for illegal drugs and performance-enhancing drugs. Testing positive in the NCAA results in the athlete losing a year of eligibility. Having to undergo a drug test is no new experience for high school athletes either. Illinois recently passed a law that states that any high school athlete in the state can be tested randomly during sports season. An interesting debate in sports testing is whether or not to include drugs like marijuana in testing efforts. Perhaps owing to the fact that marijuana is legal in some of the countries competing in the Olympics, the International Olympic Committee does not impose sanctions on athletes that might test positive for marijuana. The NCAA, however, does. Some of the arguments center around whether a marijuana drug test is necessary to determine whether a sports competion will be fair. Gary Green, who has long been involved in NCAA testing, says "There's a big debate about whether marijuana should be on the (banned-drugs) list...it's definitely not a performance enhancer." He points to drugs like methamphetamines and cocaine as stimulants that may affect an athlete's performance. You don't have to wait for random sports testing to test yourself or your athlete for drugs though. 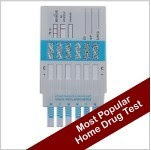 A home drug test is a very affordable way of testing for illegal drugs and will arrive at your house in just a few days. You can find a wide variety of drug tests at Home Health Testing.